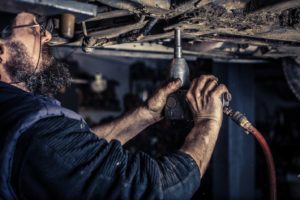 Henry is a 54-year-old auto mechanic. He has been working 10- to 14-hour shifts for decades, spending most of his time at work standing up on concrete floors. His physically demanding job has taken a toll on his body—he suffers from near-constant back and neck pain, and he’s had varicose veins in his legs for many years. His varicose veins have never caused him much trouble, but, lately, he’s been having leg cramps at night and throbbing pain during the day, and his legs feel strangely itchy. He also notices that his lower legs are swollen by the end of his long work shifts. At the urging of his wife, Henry sees his primary care physician, who refers him to a team of cardiologists that specialize in vascular problem. Henry’s specialist diagnoses him with venous insufficiency—a condition where blood flow from the veins in the legs to the heart is inadequate. It’s usually caused by blood clots (deep vein thrombosis or DVT) or valve problems in the veins of the legs. Venous insufficiency makes it difficult for blood to return from the heart to the legs, which can cause blood to pool in the legs. This can, in turn, lead to other problems, including skin discoloration and painful ulcers. Henry’s situation is not uncommon. In fact, 20% of men and nearly 40% of women in the U.S. have significant leg vein problems by age 50, according to the Vascular Disease Foundation. Twenty to 25 million Americans have varicose veins, and approximately 900,000 people have Deep Vein Thrombosis (DVT), which causes potentially life-threatening blood clots in the deep veins of the legs. Both varicose veins and deep vein thrombosis are common causes of venous insufficiency. 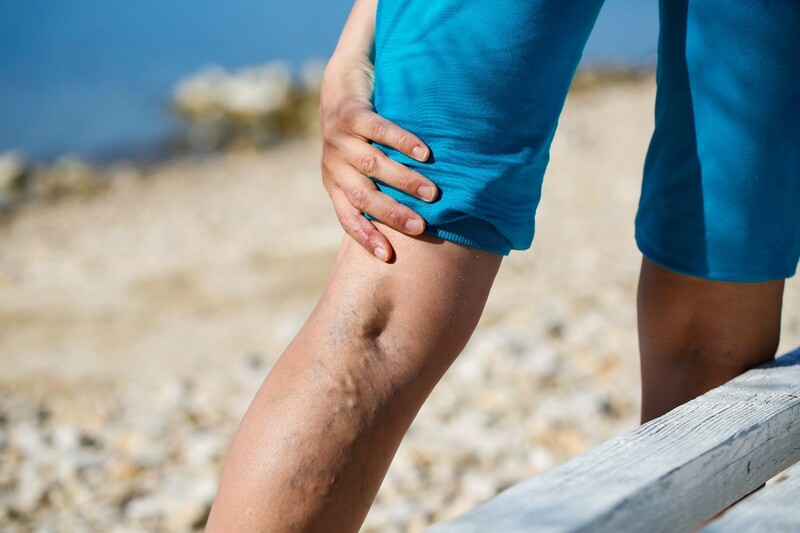 Read on to learn more about the symptoms, causes, risk factors, and treatments for venous insufficiency. Pain in the legs that gets worse with standing and better when the legs are raised is of the most common symptoms of venous insufficiency (inadequate blood flow through the veins). The two most common causes of venous insufficiency are varicose veins and blood clots (deep vein thrombosis or DVT). In people with varicose veins, the valves in the veins that open and close to allow blood to flow through are missing or don’t work properly (think of these valves as “gates,” allowing blood to flow back and forth toward the heart). Blood clots from DVT cause blood to back up below the clot, which can lead to venous insufficiency. Weak leg muscles can also contribute to venous insufficiency, as muscle contractions help push blood through the veins. Pelvic tumors and vascular malformations can also cause venous insufficiency. Age. Wear and tear can occur to the valves and walls of the veins with age. Obesity. Carrying excess weight places extra pressure on the veins. Gender. Women are more likely to develop venous insufficiency than men; hormonal changes during premenstruation, menopause, and pregnancy may be contributing factors, as hormones tend to relax vein walls. Pregnancy. This decreases blood flow from the legs to the pelvis and can cause varicose veins, which can, in turn, lead to venous insufficiency; varicose veins that develop during pregnancy usually subside without treatment 6-12 months after delivery. Muscle weakness. Action of the calf muscles helps push blood back up toward the heart; weak muscles can contribute to venous insufficiency by pushing less blood forward. Family Venous insufficiency can run in families. Sitting or standing for long periods. Sitting or standing without moving can increase blood pressure in the leg veins. Inactivity. Not getting enough exercise can weaken the muscles and cause veins and valves to weaken over time. Smoking. This causes chemicals to enter the bloodstream that can reduce oxygen levels in the blood and thicken the blood, reducing blood flow; it can lead to varicose veins, which can lead to venous insufficiency. Venogram: Test that involves injecting a contrast dye into your veins, which helps the doctor see your blood vessels on an x-ray image. Duplex ultrasound: A noninvasive test that uses a small handheld device (transducer) to check the speed and direction of blood flow in the veins. The transducer uses sound waves to produce images of your blood flow. Treatment will depend on your current health status, your medical history, and the severity of your condition. Your doctor will ask you about any prior medical procedures or surgeries you’ve had to understand how well you tolerated those procedures. Compression stockings: The first line of treatment for venous insufficiency, prescription compression stockings are specially designed elastic stockings that apply pressure to your ankle and lower legs; the pressure helps improve circulation and can also help reduce swelling. Compression stockings come in different prescriptions strengths and lengths—your doctor will determine the right prescription for your needs. Medications: Certain medications can help alleviate the symptoms of venous insufficiency; these include diuretics, which help prevent water retention, anticoagulants medications that thin the blood (e.g., warfarin), and pentoxifylline, a medication that helps improve blood flow through the vessels. Your doctor may also prescribe antibiotics to treat skin infections; however, this is not a cure for the underlying disease. 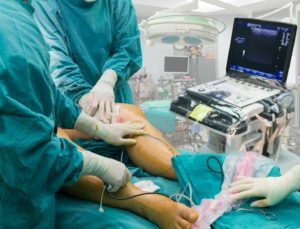 Endovenous thermal ablation: This procedure involves using heat generated by a laser or high-frequency sound waves to close up problem veins; to reduce bleeding and bruising, the veins are left in place. Because the procedure is minimally invasive and involves no incisions, patients are usually able to resume normal activities within a few days of the procedure. Sclerotherapy: Usually reserved for more advanced cases of venous insufficiency, sclerotherapy involves injecting a solution directly into spider/varicose veins, which renders the veins incapable of carrying blood. The veins collapse and are eventually absorbed by the body. This therapy is used to remove small- to medium-sized veins. Sclerotherapy helps reduce or eliminate the pain associated with problem veins, and it can help prevent complications of varicose veins, such as ulcers. It can also help improve the appearance of the legs. Vein ligation and/or stripping: Ligation involves cutting and tying off problem veins; recovery is generally fast, and patients can usually resume normal activities within a few days. Stripping involves surgically removing larger veins through small incisions; given the more extensive nature of this procedure, recovery usually takes longer (usually around 10 days), and bruising after the procedure is common. Phlebectomy: This procedure involves making microincisions (very small incisions) or needle punctures through the skin and using a tiny hook to remove problem veins. Vein bypass: In rare cases, a vein bypass (similar to heart bypass surgery) may be required. The cardiologist will take a healthy vein from another part of your body and use it to reroute the affected vein in your leg that’s being affected by venous insufficiency. Vein bypass surgery is usually reserved for only the most severe cases of venous insufficiency when other treatments aren’t working. The expert cardiovascular doctors at Cardiac and Vascular Consultants offer cutting-edge treatments for venous insufficiency. Our compassionate team will create a tailored treatment plan to help relieve any pain and discomfort you’re experiencing from venous insufficiency and related problems, such as varicose veins. Our board-certified heart doctors rank among the top 1% of cardiologists in Central Florida. Help is available for venous insufficiency. Learn more about Cardiac and Vascular Consultants, and call us at 352-606-4708 to schedule an appointment.